Juanita fulfills her lifelong dream. Like the warrior, each of us has the ability to overcome and conquer life's challenges. The woman for whom this center is named has served as an inspiration to me throughout my life. I believe it is only fitting that this center, The Juanita Center LLC, be named in her honor. Juanita was born two decades after the turn of the 20th century. 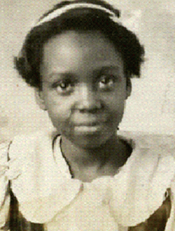 She was born and lived her early years in rural southeast Alabama when Jim Crow laws were strictly enforced. Fortunately, at the age of five, Juanita's mother remarried and took her daughter to live in the industrial northeast corner of Ohio. Her mother's hope was that the North would provide greater opportunities, and to some degree it did. 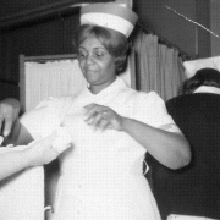 During her high school years, Juanita dreamed of becoming a nurse. After high school and during the initial years of WWII, she had an opportunity to join the Women’s Army Corps (WACs), which would give her a chance to pursue her dream. Her mother put her foot down, forbidding her from leaving home and joining the WACS. Even though Juanita was legally old enough to join on her own, she respected her mother’s wishes and stayed put. During the war, Juanita took a job in a munitions plant to support the war effort, but she never lost sight of her dream to become a nurse. She met a young man and was taken by his handsome and dashing good looks. He had joined the U.S. Marine Corps and would soon be leaving for basic training at Paris Island, S.C. After finishing basic training, he returned to Ohio briefly before heading for duty in the South Pacific. Juanita was enraptured by this young man who looked so fit and handsome in his dress blue uniform. She fell in love and told him she would wait for him. At the end of the war, they married. Her new husband took a job in the bustling and growing steel industry. And, soon they started a family. The early years of their marriage were typical. Juanita stayed home and took care of the house and the children. Her husband was the breadwinner, working long hours in the steel mills. In the late 1940s, they bought a home in a white neighborhood and moved into it with their only child. They were the first black family to do so, making them trailblazers in a way. Life seemed perfect for this young black family as they pursued a middle-class lifestyle in a middle-class neighborhood. However, soon there was evidence that everything wasn’t as perfect as it appeared. Juanita's husband started drinking heavily and living the lifestyle of an alcoholic (night life and extramarital relationships). Juanita was patient and didn’t give the drinking much thought. She made excuses for her husband: he had served in WWII—no telling what effect that had had—and he needed to relax because he worked so hard in the mills. He had purchased them a home in a middle class neighborhood, and now they had kids to clothe and feed. Juanita was determined not to lose her home or to allow her children to suffer further. She decided to divorce her husband at a time when divorce wasn’t socially acceptable. To support herself and her three children, she took on additional work cleaning homes. She decided to apply to and was accepted into nursing school. By this time, Juanita was in her 40s and had not been in school for over 20 years. Her lifelong dream to become a nurse was coming to fruition in spite of adversity and a litany of seemingly insurmountable challenges. Juanita weathered the storm. She never went on welfare or public assistance and didn’t lose her family’s home. She raised her three sons to be successful and productive members of society. She became a nurse at age 41. For the next 24 years, until her retirement, she displayed an unwavering dedication as a healthcare professional. Today, Juanita is 95 years old and is living a comfortable and satisfied life in a new condominium purchased by her three sons. Juanita's story is one of personal strength in the face of adversity, perseverance, hard work, family support, and above all, faith. She is truly an inspiration and the reason why we chose to name the Center in her honor. We proudly call ourselves The Juanita Center. In the early 1980s, I unexpectedly received military orders to go from the United States to Japan. This transfer occurred at a critical time in my life. It was a pivotal event that ultimately proved to be transformative. As I look back, the military assignment in Japan saved my life. I had never been to Japan. Yet, as the plane descended through the clouds and the land below came into view, an intense feeling swept over me, and I had the sense of belonging—that I was returning home. As best I can describe it, I felt connected and peaceful. At the time of my arrival, I could never have imagined that I would spend the next 15 years living in Japan. While there, I experienced a deep sense of spiritualism and discovered a different way of looking at myself and the world in general. I was exposed to and received education in Japanese spirituality. I practiced martial arts, Zazen Meditation, and yoga, all of which deepened my sense of self and the world around me. For me, the Warrior has strong personal significance, for it was in Japan that I began my life's work as a counselor. To me, he symbolizes the warrior in all of us: our powerful inner strength and ability to overcome and conquer those aspects of life that can rob us of happiness and fulfillment. There is no contradiction between the name The Juanita Center and our use of the Warrior logo. Together, they represent the powerful feminine energy that resides in all men and women.